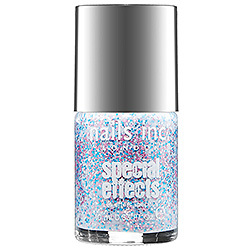 Sprinkles Nail Polish: A Sweet Treat for Your Nails! 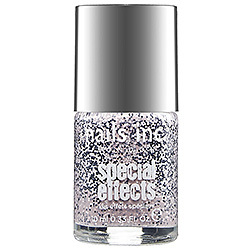 Is it just me or has anyone else ever dreamed that a nail polish existed that looks as beautiful as this…. I just love cupcakes (almost as much as I love cotton candy haha)…not only do they taste delicious but they are SOOO pretty!! Anyway, I digress. Last week at Sephora was my lucky day! When I was in the checkout line a few nail polishes by Nails Inc. caught my eye. 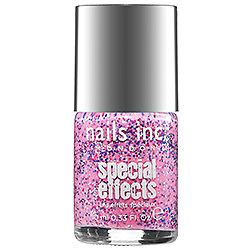 Upon closer inspection I noticed they were inspired by CUPCAKES and called “Special Effects Sprinkle Nail Polish” (and also they are named after these cute little streets in London. I die!). There are 4 absolutely beautiful colors available including pink, white, teal and pastel grey all with different colors of sparkles. GORGEOUS pink called "Topping Lane." Totally looks like the Princess cupcake no? This is what I bought "Sweets Away"...white with pink, silver & blue sparkles! "Pudding Lane"...teal with gold and navy sparkles. "Sugar House Lane" is a pretty grey shade! I love the metallic look of this polish. I am super happy with this polish. It's perfect for the summer and I will probably wear it into the fall and winter too!! Definitely be sure to check it out HERE and for $9.50 you can have your own sweet treat for your nails too! I hope y'all are having a GREAT weekend and thanks SO much for reading dolls!! !